There are many reasons that we have to send thank you cards to our friends and family. The main event being a wedding by it’s always nice to send them out for smaller events like a baby shower or even a birthday party. We’ll go over a few easy ideas on how you should handle a situation like sending out thank you cards and what you’ll need for them. First and foremost, send out thank you cards immediately. One of the worst things you can do is sit on the cards that you had waiting and to not send them out until much after the fact. Always keep consistent, and what we mean by that is, if you have a theme in mind for the party or event, we suggest that you keep in accordance with that. 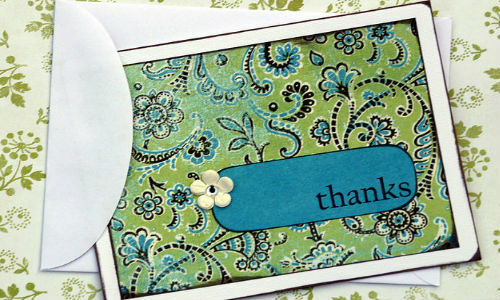 That way when your guests receive the thank you card they’ll instantly know who and what the card is from. Because they’ll remember your Star Trek themed wedding if you send thank you cards for your Captain Kirk plate set that you got as a present if you send out a Spock card. See? Consistency. The next action you’ll always want to take is hand write the card. This probably goes without saying much like the first rule but we’ll mention it anyway. It shows that you took the time to show your appreciation for the present you received from every guest. The last thing someone wants is some generic card that every other guest gets. This can be simplified as long as you keep track of who gave you what as you’re opening your presents. One of the last things is to recruit other people. While this is mostly for a wedding scenario, it’s always nice to have the help of other people. If you are sending out thank you cards for your wedding then we suggest recruiting your new husband. He should be offering to help anyway, but these are his gifts just as much as yours so it’ll be nice to have someone else there to help you keep track of everything. So there you have it! What are some ways that make it easier for you to give out thank you cards to people you know? Let us know in the comments!